AP Suite & Apartment can be found along Poppies Lane, in the heart of Kuta, one of the most popular tourist destinations on Bali, with its famous beaches and great surf. It`s just 15 minutes from the International Ngurah Rai Airport and in walking distance to almost all of important and interesting places of this area, such as legendary Kuta beach, Kuta Square Shopping Center, nightlife and Pasar Agung art market. AP Suite & Apartments Kuta offer 19 well-appointed one- and two-bedroom apartments. Each apartment is equipped with individually controlled air-conditioning, flat screen TV with satellite channels, IDD telephone, in-room safe, minibar, coffee & tea making facilities, kitchenette with microwave oven and a living room. The 2-bedroom apartment comes with a private dining area as well. Other facilities of the AP Suite & Apartment are a rooftop swimming pool with spectacular views, Agung Putra Restaurant, open for breakfast, lunch and dinner with Indonesian and international cuisine, and the Penthouse Lounge. Free wireless internet connection is available throughout this affordable apartment complex in Kuta Bali. 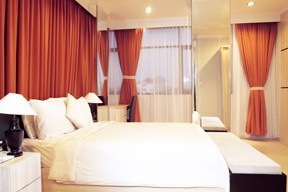 AP Suite & Apartments have a sister property next door, the Asana Agung Putra Hotel. Both properties are owned and managed by the Agung Putra Bali Group. Pleasant and modern apartments at affordable rates. Ideal for small families or couples.